Supra India is one of the greatest inventions of the seventh generation ThyssenKrupp lift platforms. Curved structure, inclined lifts with world-class technology and design, high safety protection system with formidable reliability are some of the remarkable features of the Supra. • Wireless phones and multiple stops are optional enablement. When you look into the materials used in the manufacture of Supra, high quality Anodized aluminum forms the base of the exposed surface of the lift. Aluminum gives protection from rust and it is very easy to clean. Parts are fitted with highest precision that gives a pleasing appearance. Supra is able to provide customization of the structures and features classifying the product range. They are available in various sizes and shapes. Power of the motors and capacity of the lift is updated based on its size. You can choose to include folding seats, automatic doors, safety bars, and touch sensitive remote controls and sometimes with multimedia system like Television and Audio systems. The compact structure can be fitted inside the curved stairs of the commercial complex. Because of the rigidity and non-corrosive components used, Supra lifts can be built both as indoor and outdoor system. Commercial design models are available to choose for commercial complex that provides high performance. Home lift designs are also available for multi storied houses. When you are look for ergonomic design to assist the physically challenged, you have options to choose from different models that are designed specifically to suit their needs. When you are one of richest person and you wanted a luxurious lift for your castle, you can still choose from the different models that are designed with extraordinary features like big size lifts, lift for your cars, very high speed lifts etc. When you look into the safety measures, there are mechanisms like that stops immediately when you hit an obstruction in its path, anti-crash system that detects the height and applies break before you hit the floor, Turbulence control system that adjusts the speed before you come to a stop or take off. 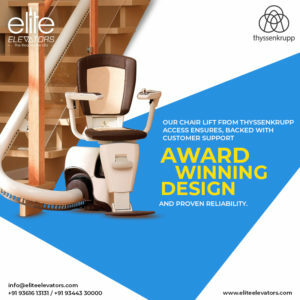 All of these features make the Elite Elevators SUPRA Stair Lift as one of the leading sold Lifts in India and also makes them a favorite choice for all walks of people. Supra India has developed great trust and is one of the challenging models for its competitors available at an affordable price. All the parts are manufactured in India, and it is giving a tough completion among other world class counterparts.